This identity crisis is long overdue. After all, Texas has boasted three of the nation’s ten largest cities for nearly two decades. But it is more eye-opening to look at the real measure of metropolitan might, the Census Bureau’s Metropolitan Statistical Areas. With the nation’s fifth- and eighth-largest MSAs (Dallas-Fort Worth-Arlington and Houston-Baytown-Sugar Land, respectively), Texas is the only state with more than one of the nation’s ten most populous metropolitan areas. Add San Antonio and Austin—Round Rock, and you have 13 million Texans residing in our four largest MSAs alone, a city-centered population that would amount to the nation’s fifth-most-populous state. We’re no longer just an urban state; almost two thirds of us inhabit the culture of an ultramodern megalopolis. Our megalopolitan culture is beginning to produce such political anomalies as Houston’s Hubert Vo, the Vietnamese-refugee developer who recently ended Republican budget-slasher Talmadge Heflin’s 22-year tenure in the Texas House of Representatives. Or consider the iconic position of Dallas County sheriff: She’s now a gay Latina Democrat. Whether this is a trend or a speed bump on the road to eternal Republican hegemony is irrelevant, however, because megalopolitan culture is reinventing Texas where it really counts: on the bottom line. Pressed to compete in a global marketplace for everything from the Olympics and major corporate relocations to everyday conventions and tourists, Texas cities that for generations have been content to metaphorically attire themselves in big hats and chaps are now desperately seeking an entirely different sales pitch. 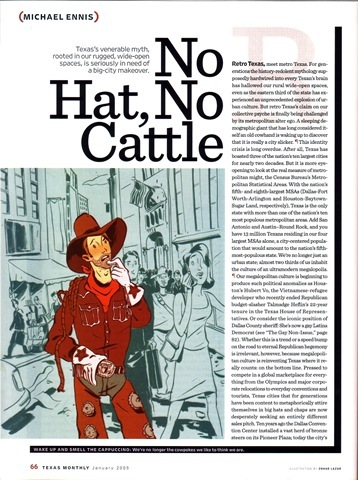 Ten years ago the Dallas Convention Center installed a vast herd of bronze steers on its Pioneer Plaza; today the city’s convention and visitors bureau has eschewed any vestige of traditional Texas imagery and is rebranding Big D as an “arts destination.” Houston, frantic to remake its oil-stained urban cowboy image, officially bills itself Space City. But the “It’s Worth It” slogan created by an innovative local marketing firm suggests that the best way to present the city in a positive light is to go negative on its inescapable urban maladies. Prospective visitors are advised that if they can just get past Houston’s hydrocarbon-fouled air and mucilaginous climate, they’ll find an edgy cultural boomtown. The new political mavericks and no hat, no cattle big-city boosterism notwithstanding, the conventional wisdom holds that Texas will never accept its urban nature. That would require a sweeping revision of a myth often thought to be archetypal—the self-congratulatory, folkloric celebration of our wide-open spaces and their fiercely individualistic (though almost uniformly Anglo Protestant) conquerors. The myth still thrives in twenty-first-century Texas, driving metropolitan Texans to buy luxury pickups and head for the new frontiers of ever-farther-flung exurbs (the suburbs of suburbs) or the Census Bureau’s new Micropolitan Statistical Areas—small, isolated cities that are mushrooming into mini-metropolises (Granbury, seventy miles southwest of Dallas, has become a model micropolis). For many Texans, revising that myth to reflect our megalopolitan population trends would be as heretical as replacing the Ten Commandments with David Letterman’s Top Ten list. But history tells us that our defining myth isn’t written in stone. Instead, the myth has proved surprisingly fickle, a Texas state of mind that has changed as the world around it has changed. In an insightful new book, Inventing Texas: Early Historians of the Lone Star State, historiographer Laura Lyons McLemore traces the invention of Texas back to the Spanish, who were the first to artfully weave carefully gathered facts and self-serving hyperbole into a colorful mythology. The pioneering history was written in the late eighteenth century by Fray Juan Agustín Morfi, a Franciscan missionary who insisted that Tejas was a cornucopia of pastoral riches and unredeemed souls, which his fellow Franciscan monks had heroically attempted to secure for crown and church. Mary Austin Holley, the learned cousin of Stephen F. Austin, wrote her Texas (published in 1836) in the picturesque style of the Romantic era. As self-interested as Morfi, she recycled his extravagantly fruitful setting, the New World Eden of the coastal plain. But Holley’s heroes had a different language and ethnicity: They were her cousin’s real estate customers, Texas’s ferociously independent Anglo American settlers. The nineteenth-century historian who most successfully reinvented Texas was Henderson Yoakum, a lawyer and Indian fighter who wrote his History of Texas in the decade before the Civil War. The politically outspoken Yoakum believed that industrial-age America would succeed on the industry of small yeoman farmers—later known as rednecks—who were destined to conquer the continent in the name of civilization and democracy. On the eve of the first industrial war, which would free the third of all Texans who were slaves and reduce the state’s plantation-centric economy to rubble, Yoakum nostalgically portrayed the Texas Revolution as a victory for his values, the providentially aided triumph of freedom-loving agrarians over evil, old-world despotism. While many of Yoakum’s contemporaries found his conclusions overblown and politically biased, later generations were more forgiving. By the end of the nineteenth century, an impoverished, defeated state still eating its heart out over the South’s Lost Cause had uncritically embraced Yoakum’s romanticized, antebellum take on Texas. Yoakum had been dead for almost half a century when Spindletop blew in 1901, auguring the underground wealth that would build urban, industrial Texas on the paradisiacal turf where Morfi, Holley, and Yoakum had set their heroic sagas. But Yoakum’s pastoral vision had become the model for textbooks and successive generations of academics, and it would remain Texans’ myth of choice well into the twentieth century. The culminating chapter in the invention of Texas takes place outside the purview of McLemore’s book. In 1931 University of Texas history professor Walter Prescott Webb published The Great Plains, a prize-winning tome that plucked the Texas myth from the coastal Eden and transplanted it to far more stubborn soil. Webb’s thesis, the ideological compass for generations of Texas writers, was largely derived from Wisconsin historian Frederick Jackson Turner’s celebrated “frontier thesis” of American culture; first presented in 1893, it held that American civilization was defined by its westward expansion from the original colonies. Webb moved Turner’s frontier farther west, citing the treeless plains beyond the ninety-eighth meridian—a line that runs roughly from Wichita Falls to McAllen—as the real man’s frontier, an arid wasteland that only a cowboy with a trusty six-shooter and a good horse could hope to subdue (Mexicans, women, and Eastern girly men need not apply). We have lived with Webb’s version of the myth for so long that we think it is the archetypal Texas myth. In reality, The Great Plains represented a startling change of direction—literally. Throughout the era of the post—Civil War trail drives and the cattle kingdoms and up until the thirties, cotton had remained the engine of the Texas economy; when king cotton was at last dethroned as Texas’s biggest moneymaker, the usurper was oil. Yoakum’s mythic Texas had been the lush coastal plain—cotton country—and his heroes small farmers. Webb’s heroes have always been cowboys and cattle barons, at home on the boundless range. With a few deft strokes of his pen, he effectively severed Texas from the defeated Old South and installed our collective psyche in the Wild West. Like Turner, who published his frontier thesis just when the Census Bureau declared America’s frontier officially closed, Webb wrote at the end of an era. In the thirties, instead of embracing their ancestral soil, agrarian Texans began one of the greatest rural-to-urban migrations in American history; by 1950 the majority of Texans lived in cities. In the sixties Larry McMurtry was wondering if Texas had ever produced an unsentimental historian; by the seventies he had relocated his own elegiac tales from moribund small towns to booming Houston. Native Texan Aaron Latham’s Urban Cowboy might have been intended as a celebration of a persistent Western ethos so powerful it could survive even if the bull became a bucket of bolts. But John Travolta’s performance in the 1980 movie came across as postmodern parody; accompanied by the brief vogue for “Texas chic,” the film was proof that Webb’s frontier myth had jumped the shark. The genius of the small-screen Dallas was that its producers and Texas-born star seemed to know as much, with Larry Hagman camping up J.R.’s suits-and-boots persona and much of the action set in downtown Dallas. However, in a final note of irony, in the mid-eighties McMurtry suddenly went retro, his trail drive epic, Lonesome Dove, extending the shelf life of the stale Webbian myth a good two decades. There are as yet no epics to define megalopolitan Texas. The culture resists easy analysis; one school of punditry, led by the New York Times’ David Brooks, claims that the nation’s exurbs are Mayberry-like enclaves purposefully isolated from the culture and values of urban America. But more-thorough studies have shown that exurban settlers differ little from suburbanites; at the same time, the big-city problems that increasingly beset suburbia are inexorably encroaching on the exurbs. In Dallas the cultural connection between Mayberry and metropolis is reflected by what might be called Neiman’s creep, the steady outward advance of high-fashion luxury retailers like Neiman Marcus or Saks Fifth Avenue as they follow the exurban march of their customers. Meanwhile, white suburban and exurban kids are the target market for inner-city rap culture. And when many of these exurbanites and suburbanites get into their twenties—or empty-nest fifties and sixties—they are making an exodus to downtown Dallas or downtown Houston. Texas’s megalopolitan culture is a bewildering mosaic of diversity. Asian kids crowd the list of National Merit Scholars in suburban school districts and Indian immigrants run exurban technology start-ups; suburban strip malls are transformed into enclaves of Vietnamese or Middle Eastern culture and exurban foodies prowl Mexican and Chinese markets. Yet even as we become ever more multicultural, we’re also becoming basically bicultural, given the rate of Hispanic population growth. The next great Texas myth might well be written in English by a Latina; already some of the highest-profile names in Texas literature—Sandra Cisneros, Dagoberto Gilb—are Hispanic. Webb limited his heroes to a small, Anglo male caste of mounted frontier nobility; the next version of the myth, if it’s going to connect at all, will require a cast so diverse and a stage so varied that it will challenge our collective imagination. How do we balance our Hispanic origins with equally rich Anglo traditions? How do we embrace the international culture of megalopolitan Texas without spurning the rural, small-town ethos of retro Texas? But perhaps retro Texas and metro Texas have never been as far apart as our latter-day mythology would have it. The first European explorers to cross our great plains weren’t seeking solitude; they were looking for the golden Cities of Cíbola. The Spanish missionaries who followed them built their Texas churches—including what is now the Alamo—in the same sophisticated baroque styles found in Madrid or Rome; the mestizo stone carvers who worked on those churches were heirs of the great cities of Tenochtitlán and Chichén Itzá. Nineteenth-century Anglo settlers declared their urbanity with all those French Second Empire or Renaissance Revival courthouses that stand in the center of so many of our small towns, sentinels of civility and cultural yearning visible from miles away. So it might ease our transition into the twenty-first century if we recognize that our megalopolises don’t necessarily represent capitulation to an alien modernity. We built them because whenever we looked across our wide-open spaces, we always saw cities of gold. Copyright © 1973-2010 Emmis Publishing LP dba Texas Monthly. All rights reserved.